This place is so incredible…nothing but nature sounds, great views, quiet mornings, and relaxing afternoons/evenings. There’s something to be said for the simple life, not everyone is built to run at a breakneck speed in the fast lane. I’m much better suited for life at this slower pace. Settling into cabin life has been pretty easy, it’s not much different than winter camping except I have a bit more time on my hands due to a more efficient stove and better shelter. The wood fired sauna has been nice and I can feel the positive health benefits after each session. I have to plan out my day if I want to use the sauna since it takes about 2 hours to bring it up to 120F. Sierra is having the time of her life running around the ranch. There’s another dog here, Charger, who Sierra enjoys running around with. They’ll wrestle on the ground, run through meadows, and nap in the sun together. It’s fun to have such an energetic and positive animal as a sidekick. The ponds just froze over so fly fishing on the ranch is done for the year. I was having a great time catching all the fun little brook trout at the pond just beneath the cabin. The fish are extremely healthy displaying vibrant coloring. Temperatures are dropping down to the teens and we had snow at the cabin last night. Next week it looks to be higher daytime temps with some days reaching as high as 50F. I am looking forward to warmer weather, it’s been frigid the past few days with daytime temps in the 20Fs and evening temps in the single digits. Ouch! I’ve been working hard to get my wood pile up to snuff for winter. I need about 10 times the amount of what I currently have processed. My daily routine for the past few week has been to go up into the forest behind the cabin and extract any deadfall which I haul down to the cabin and process at the wood cutting station. I’m storing cut wood in three places: the front porch of the cabin, front porch to the sauna, and underneath the wood benches inside the sauna. If I can completely fill up these areas then I’ll estimate there will be enough wood for about 5-6 weeks. Heating the cabin has been no issue. The Ashley Wood Stove I’m working with is fantastic - nice and big with fire bricks inside so heat retention is excellent. There’s ample surface area on top of the stove for cooking and boiling water. 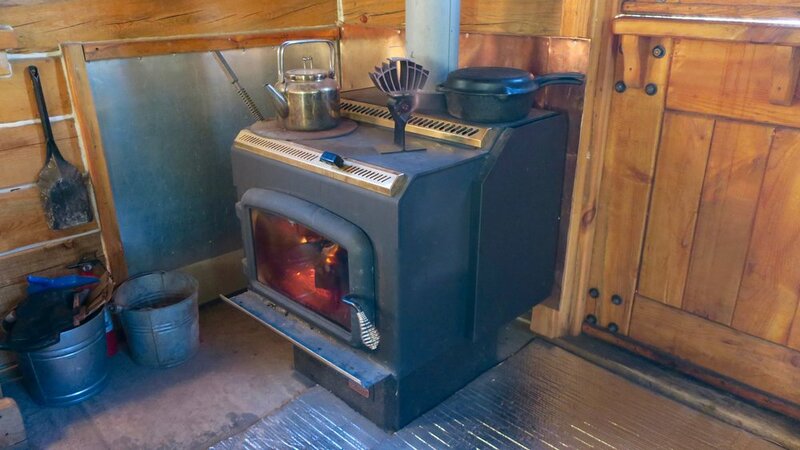 I can easily place my EcoFan, dutch oven, and full size kettle on top of the stove with plenty of room to spare. Complete my ebook “Guide to Truck Camping” - basic ebook detailing how to get on the road for full time truck camping (complete by Dec 25th). Shoot and edit 24 videos for the “Off Grid Cabin” series on my YouTube Channel. 3 completed so far. Expand the Amazon product offering on the Gear Store portion of my CBA website (complete by Dec 10th). Devise a workout routine I can do at the cabin using resistance bands. Meditate on a daily basis.